Something that I am eternally grateful for is the fact that I have grown up with excellent female role models in my family. My sister has always paved the way for me, shown me the ropes and set an excellent example as an older sister. My mother has taught me to be strong. She worked full time all throughout college so she could afford to get an education, all while being married with a child. Her mother, my grandmother, came to America from Cuba with her husband (my grandfather) and three small children with nothing. She is the strongest person I have ever met, and no matter what the situation is, her positive attitude is something to be admired. In addition to my blood, there are quite a few women in history and today’s society that I look up to for various reasons. Here are five that I believe are fit to be dubbed role models. I’m sure you knew this was coming. 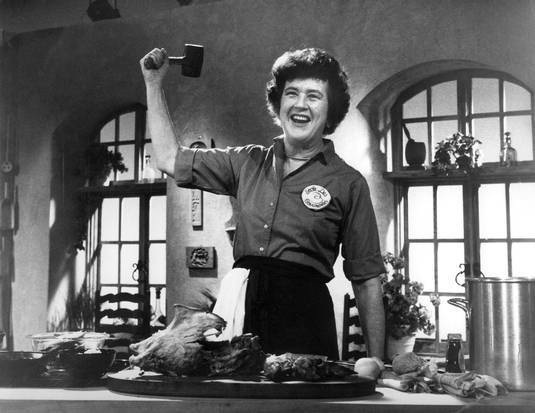 Julia Child was an American chef, author and television personality who came to be recognized for bringing French cuisine into American kitchens. Her first cookbook, Mastering the Art of French Cooking, has become a bible of sorts for the culinary community. After marrying her husband, Paul Child, the two moved to Paris as a result of Paul’s job with the U.S. Information Agency. This is where Julia really found her love of food. She began to notice a trend among French women: most of them were housewives without jobs, and she refused to become another one of them. Julia ended up attending Le Cordon Bleu, privately training with master chef Max Bugnard, publishing a successful cookbook after numerous rejections, and becoming a famous television chef. Oh, and she rocked heels and pearls the entire time. Elizabeth “Lizzie” Velasquez is an author, motivational speaker, and simply an inspiration. Velasquez has a medical condition that is so rare, it has no name. She was born premature by four weeks, has 0% body fat, and is blind in one eye. She has been dubbed “the ugliest woman in the world”, but refuses to let that ruin her positive spirit. At the young age of 17, Lizzie came across an interview she had done on YouTube with the title “The Ugliest Woman in the World”. The video had over four million views and countless cruel, hateful comments about her. She refused to feel sorry for herself. Lizzie has used her disability to help inspire others by giving inspirational speeches, writing a book and now, working on a documentary titled ‘The Lizzie Project’. She helps us see the definition of true beauty and is without a doubt someone that young girls all over can view as a role model. Below is a motivational TED talk she gave in Austin, TX. A young girl herself, Malala Yousafzai can be labeled a women’s rights activist, children’s activist, and purely a revelation. After becoming a powerful voice in Pakistan for girls’ education, Malala was shot in the head by the Taliban one day as she was walking home from school. Miraculously, she survived, and has since won a Nobel Peace Prize, the youngest to ever do so. She continues her activism, giving a speech at the UN on her 16th birthday, writing an autobiography, and achieving the support from the Pakistani Prime Minister, Nawaz Sharif, who says she is the “pride of Pakistan”. View her Nobel Peace Prize speech below. We all know Emma Watson for her role as Hermione Granger in the famous Harry Potter series, among other successful films she has worked in. However, Emma has a lot more to be admired for than just acting. While being a busy actress, Emma was able to split her time and continue her education, graduating from the prestigious Brown University in 2014. She has visited various developing countries in order to promote education for girls, and last July was appointed as a UN Women Goodwill Ambassador. Since then, she has delivered inspiring speeches and received awards for her positive voice. I think it’s fantastic when film actors/actresses, artists or musicians use their celebrity to promote positive change. Not to mention, I will always applaud her class and style! In addition to Ellen’s courage and bravery throughout the years regarding her decision to come out of the closet on national television, as well as her wildly successful talk show and hosting gigs, I admire one simple trait: positivity. Ellen Degeneres has the ability to make me laugh in the simplest of ways. She has the biggest heart, which is continuously displayed by her generosity on her show, The Ellen Degeneres Show. Amongst all of the negativity surrounding us in today’s society, Ellen continues to spread positivity. The way she has her entire audience standing up, dancing, not caring what anyone thinks. How she always has the funniest, most talented and genuine children as guests on her show, reminding us all that the innocent mind of a child should never be overlooked. Her tendency to scare every celebrity guest on her show, making them, the audience and her viewers at home laugh at something so simple. These days, it can be hard to smile or keep a positive attitude with stressful situations we deal with, the negativity surrounding global issues, constant reminders of depressing news. Ellen is certainly using her fame to put a smile on our faces, and that is something I will always admire.